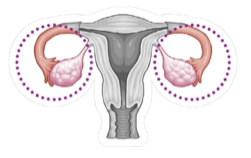 A risk-reducing bilateral salpingo-oophorectomy (Bilateral [both sides], salpingo- [fallopian tube], oophor- [ovaries], ectomy [excision of ]) is the surgical removal of a woman’s ovaries and fallopian tubes before an ovarian cancer has occurred. This surgery is the most effective way of reducing the risk of developing ovarian cancer to around 5%. It is important to remove the fallopian tubes as well as the ovaries as it is now thought that “ovarian cancer” commonly starts in the fallopian tubes. Further research is required to establish whether it would be possible to reduce the risk of ovarian cancer by only removing the fallopian tubes when the women is in their thirties or forties and delay removing the ovaries until around the time of the natural menopause. Figure: Bilateral Salpingo-oophorectomy. Showing areas removed during surgery. Who is offered a risk-reducing BSO? Women may choose to have risk-reducing BSO once they have decided they do not wish to have any more children. They also need to consider their individual risk of ovarian cancer against the risks of the surgery and the impact of a premature menopause. The risk of ovarian cancer in women who carry a BRCA1 or BRCA2 mutation does not begin to rise markedly until about the age of 40 for BRCA1 carriers and in the late 40s for BRCA2 carriers. Risk- reducing BSO is only considered once women are 100% sure they do not want to have any more children. For women carrying the BRCA1 mutation surgery to remove the ovaries is considered after 35 years of age but for women carrying BRCA2 surgery may be delayed until women are in their early to mid 40’s. How is risk-reducing BSO performed? There are two main surgical ways of removing the ovaries; keyhole (laparoscopy) or open surgery (laparotomy). Both are carried out under general anaesthetic. Whichever approach is used, after the operation both ovaries and tubes will be sent to a laboratory to check if ovarian cancer is already present. You will get an outpatient appointment about four weeks after the procedure to discuss the final pathology results. Most risk-reducing oophorectomies are done using this method. A small 1cm cut (incision) will be made in the belly button (umbilicus) through which a camera will be inserted. Carbon dioxide gas is used to inflate the abdomen so that the surgeon will be able to see the pelvic organs. The laparoscope relays pictures to a television screen and the surgeon is able to view the internal organs and abdomen. A further two or three small incisions will then be made in the lower abdominal wall to create space for the safe insertion of instruments with which the surgeon will remove the ovaries and tubes. Some women feel some discomfort after surgery, mainly shoulder pain or bloating related to the use of the carbon dioxide gas. Keyhole surgery may be performed as a day case or may involve one overnight stay in hospital. It is normal to feel tired for a day or two but most women are able to return to normal activity within two to three weeks. This procedure involves the removal of the ovaries by a larger cut in the lower abdomen, usually along the bikini line. One in 20 women who opt for ‘keyhole’ surgery have an open incision performed instead as it may not be possible to perform the procedure with the laparoscope. Women who are more likely to need an open incision include those who are overweight, those in poor general health, who have had previous operations on their abdomen, who have had a hysterectomy, women with a disease known as endometriosis and women with a condition known as pelvic inflammatory disease. The average stay for open surgery is up to five nights and complete recovery may take four to six weeks. Should I have a hysterectomy too? Hysterectomy, or removal of the uterus has not been recommended for women with BRCA mutations to reduce the risk of cancer. Cancer of the lining of the womb, known as endometrial cancer is the fourth most common cancer in women and in a third of cases is linked to obesity. There is an increased risk of endometrial cancer with other gene mutations such as those found in Lynch Syndrome although one study recently suggested there may be an slightly increased risk in women with BRCA1 mutations but further study is required. If you have other gynecological problems such as fibroids or previous abnormal cervical smear. You have previously been taking tamoxifen and may have an increased risk of endometrial cancer as a result. You would prefer to be able to take oestrogen only HRT, rather than combination HRT with additional progesterone. This would be particularly important if you have decided that you do not want risk reducing mastectomies. What are the complications of risk-reducing BSO? There are complications associated with of any type of surgery. The main possible complications are infection of the bladder, wound or urine, bleeding at the time of surgery requiring a blood transfusion, or the formation of blood clots. There is also a risk of bulging from the small abdominal incisions and damage to surrounding organs including the bowel or bladder resulting in laparotomy (open procedure) to repair them. Fortunately these complications are relatively rare. Women at greater risk of complications include those with other illnesses, those who are overweight, those who smoke and those who have had previous surgery. You should discuss your own individual risk with your surgeon. What are the advantages of risk-reducing BSO? Risk-reducing BSO minimises the lifetime risk of ovarian cancer to less than 5%. If a woman with a BRCA1 or BRCA2 alteration has a risk reducing BSO performed before they reach the menopause then studies have shown that they may also reduce their risk of breast cancer by up to 50%. What are the disadvantages of risk-reducing BSO? While risk-reducing BSO minimises the risk of ovarian cancer it cannot reduce the risk to 0%. On very rare occasions it is not possible to remove all ovarian tissues due to scar tissue (adhesions). Another rare situation is that women may develop cancer of the lining of the abdominal wall (peritoneum). Once the ovaries are removed, a woman is no longer fertile and is unable to have children naturally. Women choosing to have risk-reducing BSO before the menopause may experience the symptoms of a surgical menopause, which is described below. Some may have no significant symptoms at all but other women may find menopausal symptoms quite distressing.